Mint Chocolate Chess Tartlets - tastes like Christmas! SO easy and makes a ton. GREAT for parties! Can make ahead of time and store in airtight container. Sugar, cocoa powder, cornmeal, flour, vinegar, butter, eggs, mint, mini phyllo tarts. Top the tarts with whipped cream and crushed mints. Everyone RAVED about how great these were. YUM! These Mint Chocolate Chess Tarts taste like Christmas. Chocolate + Mint = Christmas! My favorite holiday flavor combination. 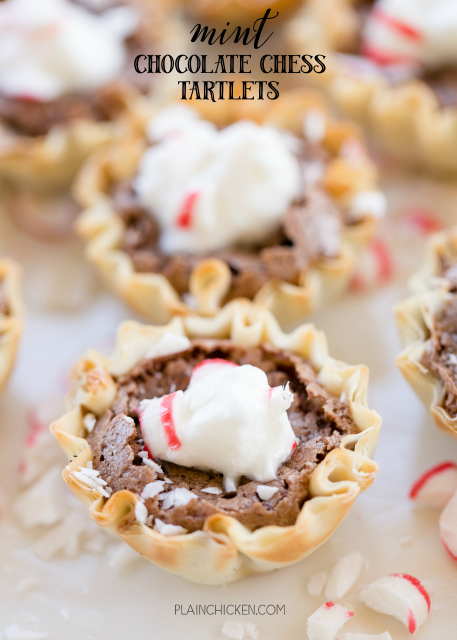 These Mini Chocolate Chess Tarts are super easy to make. It literally took me less than 5 minutes to have them ready for oven. This recipe makes A LOT! I got 90 tarts out of this recipe. They are small, so you need a lot of them. This recipe uses mini phyllo cups. You can find them in the freezer section near the puff pasty and phyllo dough. The mini phyllo cups come pre-shaped and ready to bake. All you have to do is fill them with the chocolate chess mixture and you are good to go. These tarts don't rise very much, so make sure to fill the phyllo cups up almost to the top. 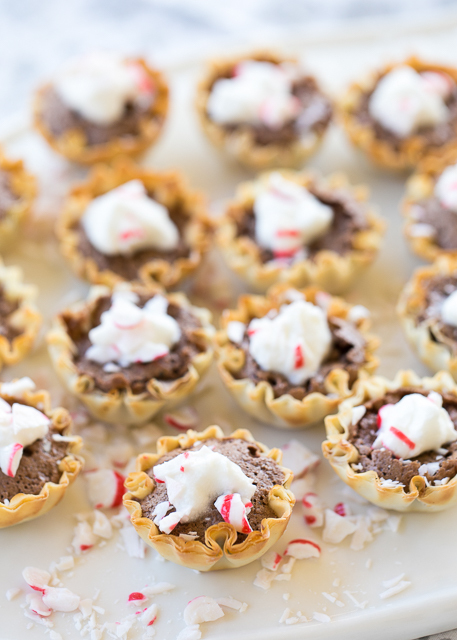 I topped our Mint Chocolate Chess Tarts with a tiny dollop of whipped cream and sprinkled some crushed candy canes on top. Do this right before serving. Preheat oven to 350ºF. Place phyllo pastry shells on 2 large ungreased baking sheets. Set aside. Whisk together sugar, cocoa, cornmeal, flour, vinegar, melted butter, eggs and mint extract. Stir well. Spoon batter into pastry shells. (You can fill almost to the top). Bake for 25 minutes or just until set. Allow to cool and garnish with whipped cream and crushed mints. Could you put this into a pie shell? I am sure you could. I am not sure of the baking time since I’ve never made it this way.